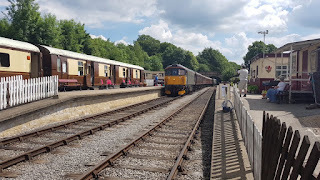 Another lovely hot day saw our Thursday DMU service have reasonable loadings, complimented by a coach party who had a ride and afternoon tea in the Station café. A big shunt was going on in the yard to position vehicles for the forthcoming weeks but it was a slow process in the heat! Understandably not quite as busy as Saturday given a certain excellent football match gripping the nation but we still did well in the sunshine. The highlight of today was a group who visited for on train tea by heritage bus and a beauty it was too! Down the yard, work continued on TSO 4440 and also on the Derby Lightweight project in the shed. Outside the Class 73 had it's air frame painted inside to allow the tanks and valves to be reinstalled. The Ecclesbourne Valley basked in glorious sunshine today and our visitors were out in force. Firstly a group of heritage railway enthusiasts arrived from Bristol. With notebooks and pens to the ready they departed on a very comprehensive yard tour facilitated by Richard. I believe every item of rolling stock/ motive power was suitably photographed and catalogued before they enjoyed a trip to Ravenstor then Shottle for some further stock identification and recording. The second service of the day required our catering team to provide some ad hoc afternoon teas as visitors had seen the carriage laid out ready for a booked service which had stimulated their appetites. Thanks to Helen for organising this at very short notice. Shortly after departure of the 13.20 Duffield service, a coach party from Essex pulled into the car park. This was scheduled to arrive for the 15.15 return service to Duffield but the driver felt his passengers would enjoy a longer visit to our railway. So a coach load of 40+ descended on the station cafe for refreshments. 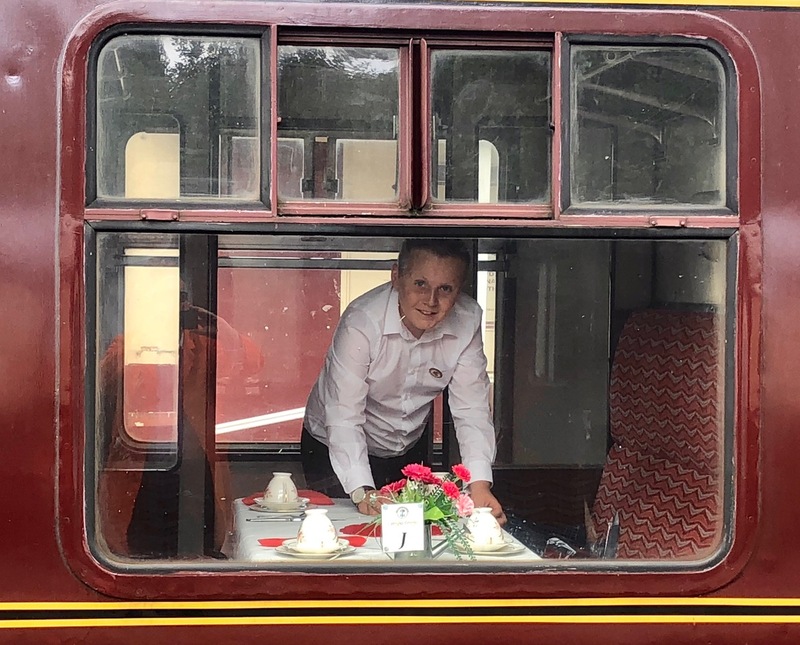 The team were already busy serving customers and preparing sandwiches for the last train service of a party from Rotary who were joining the train for afternoon tea so one can imagine the challenge the catering team faced. Thankfully, they rose to that challenge and were able to cater for the unexpected rush. My grateful thanks to the catering team who were very busy throughout the day and a special mention to our youngest volunteer, Kyle Tait who prepared and laid the compartment tables for the afternoon tea service. We achieved consistency high passenger numbers on all trains today and it was great to see the stations so busy. Down the yard over running maintenance on 'Brian Harrison' meant 'Iris' undertook the Ravenstor service. It is hoped that we will be back to steam on the incline for Sunday. There was much banging and clattering coming from the maintenance facility and I will leave it to Tim Oakes to brief you on progress. Between passenger trips on the miniature railway Ron could be found preparing the ground for the next extension to the line and I'm sure he would appreciate any help anyone can offer with this project. Today's service was supported by the booking office staff, EVRA shop, catering team and miniature railway. A most enjoyable and commercially rewarding day. Thursday saw the continuation of our mid-week DMU service. Passenger numbers were average for a Thursday being slightly down on last week but up on the week before. Today we hosted a Bronze Drive a Diesel experience for four lucky participants who firstly sampled the delights of Iris followed by the Class 33 after lunch. This is the last booked working for the 33 before it heads off to the East Lancs' Diesel Gala as a special guest on 6th - 8th July. There has been quite a bit of activity down the yard. The Derby Lightweight has been receiving roof repairs and all of the windows have been cleaned and resealed to ensure water tightness. If these basics are done correctly the interior should last for a very long time without water damage. Yesterday, Class 31 601 received attention to the braking system to adjust it to the correct settings and the underframe painting continued. All of the missing components from when it arrived have now been returned to the locomotive and it drove a few test runs up the 1 in 27 incline yesterday without issue. Looking promising for our gala in August! Similarly for the gala in August, 08605 received some further routine maintenance today in the form of checking and correctly lubricating the axle box pads. This work should enable a test run soon to make sure there are no hot boxes on longer distances. Yesterday, the S&T guys were down at Shottle doing further preparatory work on the base for the signal box. A most satisfactory day in the valley. 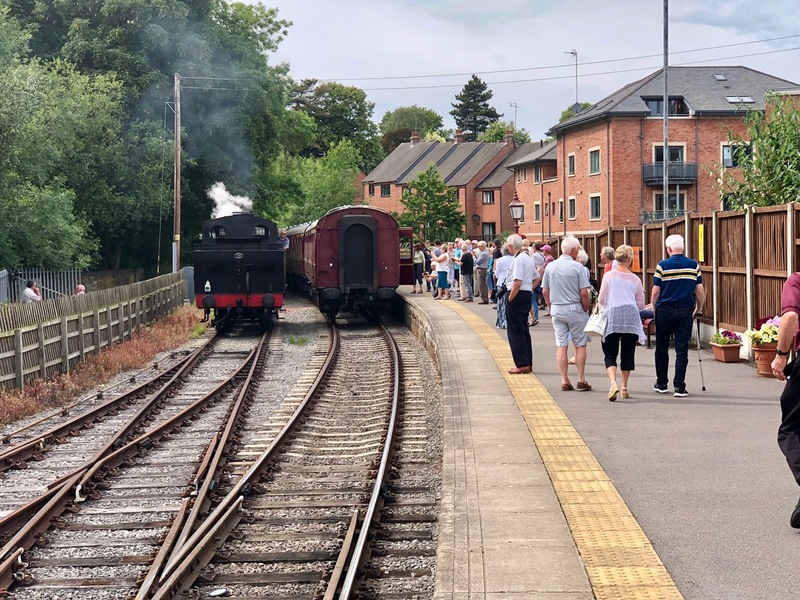 The steam hauled service on the Duffield line proved to be popular all day but also there was a real buzz around Wirksworth Station as the classic car club believed to be bringing ten vehicles actually turned out to be bringing ten lots of ten vehicles on rotation. Most of the vehicle owners went to the café which did cause mild shock but everybody was most complementary. The train service was further boosted by another party too. 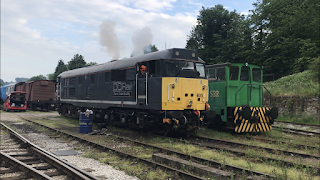 The Maintenance Team in the yard were having an English Electric fest as 31206 finally had the governor issues resolved which had been causing a lack of top end power. Next door 31601 had further electric work undertaken after the fitment of a replacement battery charge diode. The underframe components on the same loco were also being painted to spruce up exterior appearance. Meanwhile, over the other side of the yard work was progressing very well on 73210. Both vacuum exhausters which have never ran in preservation were successfully ran up and tested. The air frame area was also cleaned up and painted ready for the components to be put back. In the Engineerium, further work on the windows of the Derby Lightweight trailer saw the conclusion of this part of the project pending moving over to the other side of the shed. Work was also progressing on BSK 35006 and TSO 4440. A day of multitasking today as we hosted a Silver Drive a Diesel Experience and a private DMU charter weaved in between. The experience participant enjoyed Iris all to hisself (and the instructor and guard of course) this morning, before arriving back at Wirksworth for lunch. Whilst he was having lunch, a separate crew set off to Duffield in Iris to pick up a private party. After lunch, the experience participant enjoyed 31206. Whilst he was out and about on the line the charter people enjoyed lunch in the café before taking a long tour round the yard and sheds and a ride to Ravenstor. When the experience finished at around 16:00, the charter went back to Duffield on Iris to go home. Followed that? Down the yard, the Class 108 exam continued with oil changes being the aim of the game. Jon also sanded down the maroon on the south end of the platform shelter to give that a lick of paint. That end is always in the sun and it had started to flake off. A reasonable day on the trains today. The service was handled by Iris but it was well loaded most of the day. This is good for an out-of-holiday Thursday. It was helped by a group on the middle train who seemed to be very jovial. They enjoyed a meal in the café afterwards too. Down the yard work continued on the examination of the Class 108 and also the renewal of guards van paneling. Previous water ingress had gradually damaged the panels. The S&T dept had a day of gathering materials for constructing the base for the signalbox at Shottle. This will enable the former Oddingley box to be relocated to where we need it to be. These were gathered on a wagon ready for taking to site next week. A duo spent the whole day with the fire extinguisher supplier doing the annual recertification. This is a bigger job than it sounds! A peaceful day in the valley. In the Maintenance Facility, the Derby Lightweight trailer car was having the sliding lights refurbished and further finishing touches were being put on BSK 35006. This afternoon recently arrived 08605 was run up and down the car park road. The condition isn't as good as 08704 but routine maintenance should improve this. In to the evening and fault finding continued on the electrical issues with 31601. The fault was traced enough to temporarily isolate it, allowing the engine to be started for the first time in preservation. Strangely no drama for a 31. Another pleasant sunny day with the first of our summer Thursdays. It was a steady day comparable to the same day last year but those who travelled said that they had a thoroughly enjoyable time. Down the yard, the C examination on 53599 got under way with investigations into why No1 engine is making a strange ticking sound. Work also started on replacing some rotten wooden panelling in the Guard's compartment, caused by previous water ingress. The Jinty, which was repaired by the home railway's maintenance team on Tuesday, had a steam test today and should be good for service at the weekend following last Sunday's issues which prevented it from operating. As I write we are taking delivery of a second 08 shunter, which has arrived courtesy of Rivieria Trains who have brought it for kind-of warm storage. It is numbered 08605 and was collected this morning from DB Cargo at Wigan. The locomotive is fitted with the equipment for remote control, although regrettably the controller isn't with it so we won't be playing with that just yet! I have had a rare day at Duffield today and I thought I would share a few photographs of the station. It really is a credit to the volunteers who work at Duffield as the station is beautifully well kept. 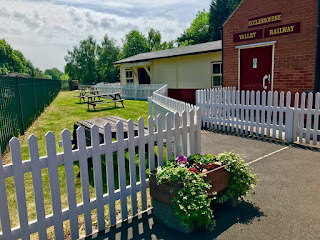 WyvernRail PLC, Ecclesbourne Valley Railway. Wirksworth Station, Coldwell Street, Wirksworth, Derbyshire. DE4 4FB. 01629 823076. 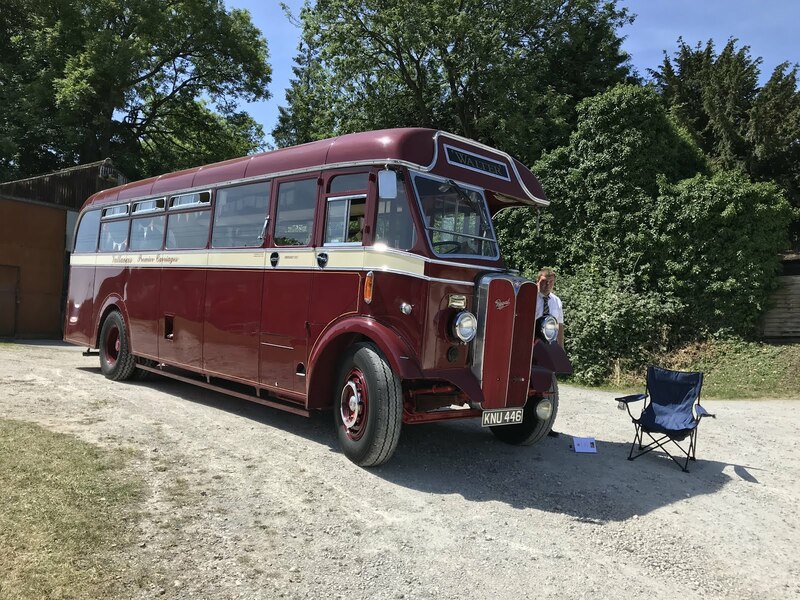 Another day in glorious sunshine with good passengers numbers throughout but one that started off with a morning of many parts, parts drawn together by the common factor that they were all leaking! First news came from up the yard that the Jinty has developed a "water feature" where water shouldn't be and it had been failed. My thanks go to the DST who acted very quickly to arrange for alternative traction and crew to cover their services, more of that later. Shortly after this No3 hearing of the news that the Jinty was getting the day off decided that sounded a rather fine idea and promptly started also leaking water, today was clearly not a day for the RO to buy a lottery ticket! Iris was rudely awoken from her day off and put on duties on the incline and my thanks go to Graham, Joe and Pete who set sail in 33103 Swordfish with Chris, Howard and Pat as on train crew exactly on time for the first service. In view of all the above a remarkable effort, I might also add one of the guys was working on their birthday. Also my thanks go to Eric and Steve who crewed the inclined service for the rest of the day. Plans are already well advanced to return both steam locomotives to the former glory in the very near future. Down the yard work was starting on the painting of Tim's brake van and in the engineerium work was finishing on the latest carriage which is going to look truly resplendent when it is revealed to the world in the near future. A coach party arrived in the morning to travel on the mainline service and a party travelled to Wirksworth later in the day to sample our food in the Pullman buffet which also had a busy day. The bookshop reported a good takings and Duffield was also busy with as our passenger took advantage of the range of items on sale at our southern terminus. It was quite noticeable as the mainly services arrived at Wirksworth, the stream of smiles and thanks as people left us, we clearly continue to do many things very right. As I sit here with my feet in a tray of tepid TVO I look back on a day of many challenges but one where we closed proceedings providing all promised services and sending away many happy customers. My thanks to everyone involved in todays successes. I leave you with a picture of Swordfish on final approach to Platform 2 in the glorious sunshine. We enjoyed another successful steam Saturday down at Derbyshire's favourite branch line with the 'Jinty' on the Duffield to Wirksworth Line and 'No 3' on the incline. Down the yard there was much joy from Joe Marsden who successfully resolved a long standing vacuum problem with the 'bubble car'. Final preparations also continued on the 'BSK' which look great following its period of re-furbishment and is scheduled to return to traffic on Tuesday for the first cream team train. 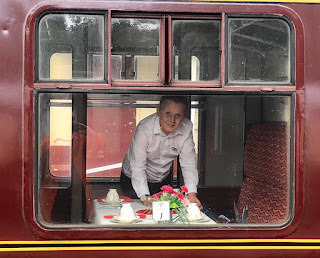 Richard conducted his ever popular yard tours which are not only enjoyable and enlightening for our visitors but voluntary contributions make it another income stream for the railway. John Rhead held a loco hauled stock preparation briefing for interested guards before today's first Duffield service. Please spare a thought for our footplate crews on both steam services who worked extremely hard in uncomfortably high temperatures today. Thanks go to our catering team who ensured there was a steady stream of bacon rolls, bottled water and ice lollies available to keep our crews hydrated and their energy levels up. The catering team also played host to a small party on the train which everyone seemed to enjoy. Today's service was supported by the EVRA shop and miniature railway and my thanks to all our volunteers who gave up their time to ensure our visitors could enjoy a day at our railway and delight at the beautiful Ecclesbourne Valley in bloom. The carpet of forget-me-nots along the 'racing straight' looks stunning.